And for this Yale School of Management graduate that means more than just the minty fresh way. Paul Jessen’s father once gave him a plate with the words “The King of Compost” on it. Maybe that doesn’t sound like the kind of gift you’d give a Yale School of Management graduate whose first post-business school job was a classic corporate gig, working with the Philips Sonicare brand in Stamford, Connecticut (yes, that would be the electric toothbrush). But his father’s gift, teasing though it might have been, is hardly out of context. Jessen has a deep passion for sustainability, and at Tom’s of Maine, he’s been able to bring that to his job as innovation manager. We talked to Jessen about everything from all-natural deodorant for the tween set to Tom’s of Maine’s progress toward making its headquarters in Kennebunk and its manufacturing facility in Sanford zero-waste. HEAD NORTH: After a few years at Philips Sonicare, Jessen was ready to move his growing family (he has a soon-to-be 8-year-old daughter and 5-year-old son) closer to his in-laws in the Boston area, so he asked a head hunter to look for work there. “I always thought the dream would be to work for a company that made something meaningful and was a net social good. And was also a great place to work, where you are part of a values-based corporation and not just some cutthroat organization.” The head hunter told him about a perfect opportunity at Tom’s. Of Maine, where Jessen had never been. “To me it sounded like the Arctic Circle.” Though he started work at Tom’s just as winter was getting into full swing in 2012, he’s come to realize that Maine is hardly the North Pole. “We couldn’t be happier.” As innovation manager, Jessen’s directive is to improve the sustainability of Tom’s current products, whether with packaging or ingredients, and help the company create new products. BEHIND THE DESK: Jessen recently oversaw an eco-friendly renovation of the old mill on the Mousam River where Tom’s has been headquartered since the early 1990s. (He said about 90 percent of the company’s products are made down the road in the Sanford manufacturing facility; items like the bar soaps are made in Rhode Island). 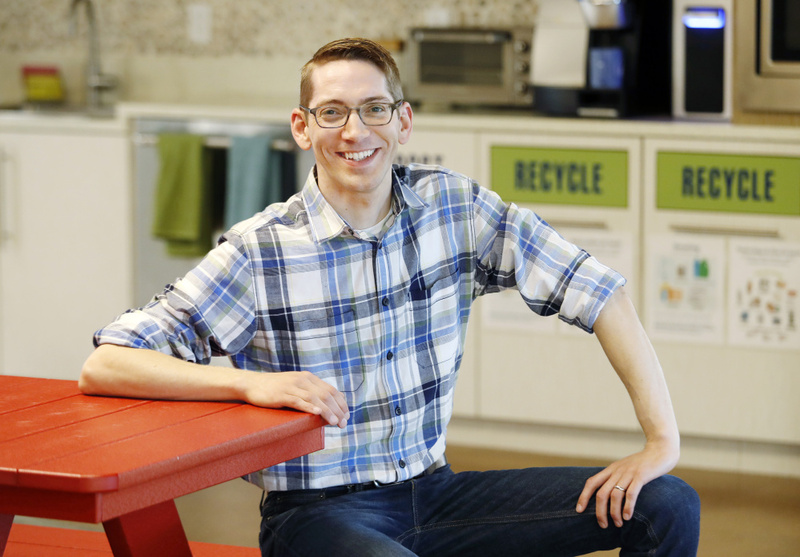 The company signed up with We Compost It!, installed a picnic table in the communal kitchen made from recycled plastic and participates in the TerraCycle program, which offers free recycling for tricky packaging, like toothpaste tubes. Tom’s set goals for achieving zero waste by 2020, and in many categories it is ahead of its goals, thanks to new elements like high-efficiency LED lighting with occupancy and daylight sensors, And the light fixtures? Made with upcycled toothpaste packaging. WICKED COOL: In its more than 45 years in business, Tom’s has been known for its contributions (10 percent of profits) to nonprofits and organizations that support “human and environmental goodness.” The Sanford manufacturing facility has used wind power since 2007. “To some extent we all wear a sustainability hat,” Jessen said. “In my role, I get to look at it pretty concretely on a product-by-product level.” The popularity of Tom’s children’s toothpaste, with its all natural labeling, has opened the door for many other health products. Last year the company introduced a baby-care line (shampoo and lotion), plus a new line of “Wicked Cool” deodorant aimed at the 8-to-12 set. COMES A TIME: And their parents, for when they hit what Jessen calls that “holy crap moment,” ie, when “you first realize you have to start talking about deodorants with your child, as awkward as their conversation is.” Tom’s aimed to create an all-natural option “that parents can trust and that the children will like.” Jessen worked to find a green replacement for the non-renwable, natural gas-based propylene glycol used in its deodorants, and found it in a vegetable-based propylene. Wicked Cool is available at the South Portland Target now, as part of a special program, and will roll out nationwide over the coming months. The boy’s version is called “freestyle” and has a citrus scent and the girl’s is called “summer fun” and smells like strawberries. Or like tween spirit.